The Radioactive Yak: Professional Android Application Development: Out Now! Professional Android Application Development: Out Now! Professional Android Application Development ships tomorrow (Tuesday) from Amazon US, so those of you who pre-ordered should be seeing your copies in a couple of days. I'm really excited and can’t wait to find out what people think. Chapter 1 is available as a free PDF download [pdf] from the Wrox site if you want to learn more about Android before you commit to a 400 page tome. The TOC and index are there too. Chapter 7 [pdf ] -- which focusses on maps, location-based services, and the geocoder -- is available too. Every concept in the book is supported with code snippets and a bunch of detailed step-by-step examples -- all of which you can download from the Wrox Open Source site. If you're looking for details on something specific, Amazon's "Search Inside" is a surprisingly useful resource. I'll be looking to answer Android questions at the Wrox P2P forums, StackOverflow, and the Android Google Groups. You can follow me on Twitter or FriendFeed, or just get book related news from the books Twitter feed and Friend Feed Room. I'll tweet any 'bugs' and changes to the text or code samples, as well as updates on any SDK releases that cause book code samples to break. 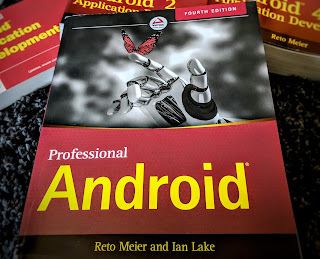 To celebrate the book release I'll be posting a bunch of stuff about Android, including tutorials, walk throughs, and open source projects -- both here and other places online. As luck would have it I got my G1 last week, so I can finally test and tweek my Android applications, so expect to see announcements about them in the coming days and weeks. I definitely have to pick up a copy of this book. My friend (@nintender on twitter) is looking at writing a BeTwittered app/port for Android, and I'm very interested myself as I'm generally just hoping that Android really takes off because it looks like a nice break into the cellular phone/mobile market. It really looks like a fun new platform to add to my venture into programming. TIA for sharing your knowledge. Good luck, and don't hesitate to ask if you have any questions. I thoroughly enjoyed reading your Android Dev book. Your To Do and Earthquake examples are excellent! I especially liked how you enhanced these apps as you covered new topics. I've been running your examples through both the emulator and G1. Chapter8's Earthquake examples throw sqlite exceptions. Is your code up to date with SDK 1.0? I'm really glad you enjoyed the book. The code should all be up to date with SDK 1.0, but the timing of the release meant that a couple of things may have slipped through. I'll contact you off-list to get the details of those SQLite exceptions to figure out what's going on. This is the very useful book for android program developement. But complete map application is missing with direction and navigation.. Please update the book give the complete examples..